Highrise CRM is a solid application for managing your customers and contacts. Perfect for small businesses, nonprofit organizations, and freelancers, it gives you a central database to keep all your information about your customers as well as your notes and emails. Highrise allows you to save as well as organize your notes and email conversations for up to 30,000 customers and contacts. It can also track your business deals and proposals. Likewise, it allows you to share status updates about a project or deal with your sales team or the entire company. It also permits importing data from vCards, Microsoft Outlook, ACT!, and Basecamp accounts. The software has over a hundred feature add-ons, which you can use for your business. Highrise prepares you to do business better. It keeps track of your phone calls, emails, notes, follow-ups, and tasks with your customers and sales team. Highrise can be your homebase for everyone that you consider important to your business. It is a smarter way to keep track of your customer relationships. Highrise also tracks your leads and deals. All your pending sales leads, proposals, even your closed deals or unsuccessful projects are monitored in Highrise. It acts as your personal assistant. When you use Highrise, all your contacts and communication history can be shared across your team or entire company. With Highrise, everyone is always on the same page. Email management is easier with Highrise. You can access your emails using Highrise. You can also easily import and export your email contacts from one program to another. You can build just one web-based address book for your entire company. Highrise also sends instant reminders via email or SMS/text, making sure you do not miss an important client call or meeting. Highrise also lets you to review conversations, such as calls, meetings, and customer relationships. 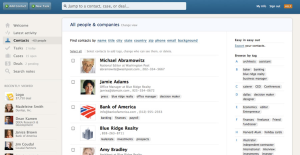 It allows you to save and organize notes and email conversations for up to 30,000 customers and contacts. Everything in your Highrise account is safe, secure, and password-protected. What Problems Will Highrise CRM Solve? There are well-liked and widely used applications in each software group. But are they necessarily the best fit for your enterprise’s special needs? A market-leading software solution may have thousands of customers, but does it present what you need? For this reason, do not blindly invest in popular systems. Read at least a few Highrise CRM reviews and mull over the aspects that you wish to have in the software such as the price, main tools, available integrations etc. Then, shortlist a few systems that fit your needs. Check out the free trials of these platforms, read online comments, get explanations from the vendor, and do your homework thoroughly. This in-depth research is certain to help you choose the finest software platform for your firm’s unique requirements. How Much Does Highrise CRM Cost? We realize that when you make a decision to buy CRM Software it’s important not only to see how experts evaluate it in their reviews, but also to find out if the real people and companies that buy it are actually satisfied with the product. That’s why we’ve created our behavior-based Customer Satisfaction Algorithm™ that gathers customer reviews, comments and Highrise CRM reviews across a wide range of social media sites. The data is then presented in an easy to digest form showing how many people had positive and negative experience with Highrise CRM. With that information at hand you should be equipped to make an informed buying decision that you won’t regret. What are Highrise CRM pricing details? What integrations are available for Highrise CRM? Pros: Highrise is very intuitive and user-friendly software, you don’t need to waste time on trainings because it’s easy to use. The good thing is that helps us with all the basics we need. Cons: We don’t have dislikes by now. We love the updates and features. Pros: This is wonderful tool for managing large client bases. We are able to manage more than 400 different accounts throug Highrise and all of them have different needs and they are in different stages of their company life cycle. Cons: There is still manual entry, they need to improve this one because lot of products do the things automatically. Highrise is intuitive and user-friendly system that is easy to learn and it doesn’t have a learning curve. It is helpful for all the basics.